David Raab, longtime marketing automation expert, raises a little heck with the idea that the game is over, there can be only one, and it is Hubspot. 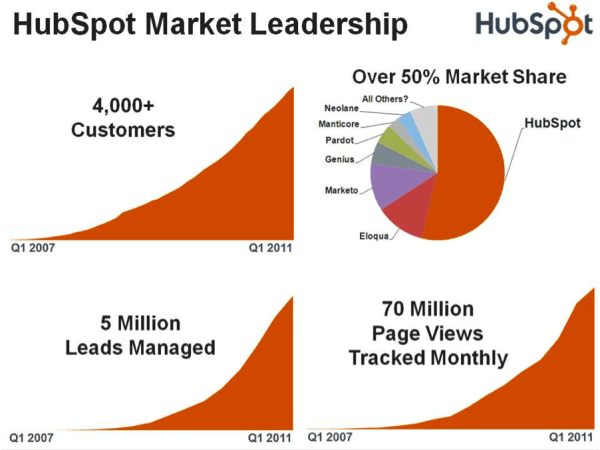 He also pointed to the little inconsistency in Hubspots graph of lead sources which shows email and not inbound to be the lion’s share. That caught my eye too. Read David’s article to see what Dharmesh had to say on that one (good explanation). This entry was posted on March 8, 2011 at 10:46 pm	and is filed under business, cloud, Marketing, strategy, venture. You can follow any responses to this entry through the RSS 2.0 feed. You can leave a response, or trackback from your own site.